After the biggest win of his life, John Millman felt guilty. The Aussie upset five-time US Open champion Roger Federer, 3-6, 7-5, 7-6, 7-6, on Monday night to make his first Grand Slam quarterfinal. But Millman said he was well aware that Federer had an off day in Arthur Ashe Stadium. Federer had been 40-0 against players ranked outside the Top 50 at the US Open, and Millman, ranked No. 55, had been 0-10 against Top 10 players. 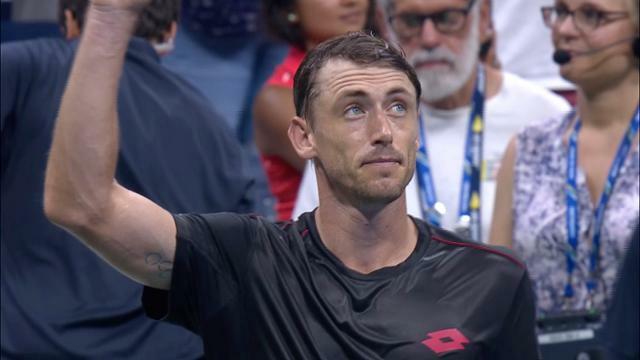 “I felt a little bit guilty today because he didn't have his best day, and that's for sure… Probably to beat him I needed him to have an off day and I needed to have a decent, good day,” Millman said. Federer hit 76 unforced errors, including 10 double faults. The 37-year-old Swiss, who last won the US Open in 2008, also tossed in two double faults in the fourth-set tiebreaker. But Federer didn’t search for excuses while he reflected on the loss, his earliest at the US Open since 2013, when he fell to Spain’s Tommy Robredo in the fourth round. “I just thought it was very hot tonight. Was just one of those nights where I guess I felt I couldn't get air. There was no circulation at all. I don't know, for some reason I just struggled in the conditions tonight. It's one of the first times it's happened to me,” Federer said. SEE ALSO: John Millman stunned Roger Federer in the fourth round of the US Open to reach the quarterfinals in Queens. The 20-time Grand Slam champion trains in warm climates and hot conditions, such as 120-degree weather. But for whatever reason, Federer’s body couldn’t handle the humid and sticky conditions inside Ashe. Millman and Federer trained together in Switzerland before the grass-court season earlier this year, and they share a mutual respect for each other. “Roger's a hero of mine. I look up to him. I really like his team. He's always been, one of the guys in the locker rooms, we'll always chat, very approachable,” Millman said. “I love his intensity. He reminds me of David Ferrer and those other guys that I admire a lot when I see them, when I see how they train, the passion they have for the game. He's got a positive demeanor about himself on and off the court,” Federer said. Millman admitted to feeling overwhelmed at the start of his first fourth-round match at a Grand Slam. Seeing Federer across the net and the bright lights of the largest tennis stadium in the world were all a bit much for the 29-year-old Aussie, who reached his first ATP final in April in Budapest. But he settled in quickly. “As the match went on, I felt very comfortable in terms of my mental state. Felt very relaxed. That obviously helped me tonight,” Millman said. The Aussie overcame right shoulder surgery that forced him to miss 11 months, from May 2013 to April 2014, and groin surgery that made him sit out four months at the start of the 2017 season. And after shocking Federer on Monday night, Millman is believing in himself to overcome the odds once more and stun two-time US Open champion Novak Djokovic during their quarterfinal on Wednesday.